Cut the strawberries in half and put in blender. Add the tequila and orange liqueur blend until well mixed, taste and adjust the liquor if needed. If serving over rocks, pour into glasses filled with ice. For frozen margaritas, add a good amount of ice to the blender with the puree. Blend until the ice is crushed and the consistency is slushy. Moisten the rims of the glasses with a slice of lime and garnish the rims with sugar or salt. 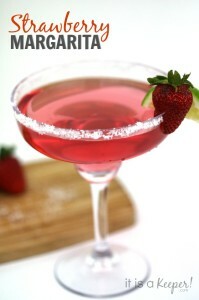 Serve with strawberries and limes as garnish.